We’ve been selling a lot of pre-assembled North Paws over the last few months, and we’ve had several people write in with issues about distorted directions. Turns out these people either hadn’t calibrated, or couldn’t figure out how to get calibration to work – and I agree, understanding it from our written description (second last part of Step 3) is pretty difficult! So, I’ve made a video which will hopefully make it super clear! 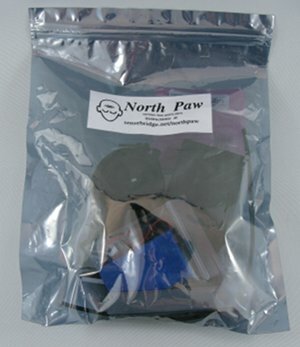 North Paw available at Think Geek! The North Paw is now available at Think Geek!. I’m super impressed with the quality of their marketing – the illustration to the right very quickly conveys how the device works, much better than a verbal description is capable of doing. I’ve found lots of people think, even after a good description of how it works, that it vibrates when you face north. Which of course would be much less useful than what it actually does :-). Anyway, I’m glad to finally have a reseller, and despite some mountains of paperwork that I had to do for the first lot, it all worked out great in the end! or similar, i.e. crazily lop-sided. It seems to always be the x-axis which gets the bad treatment. Anyway, long story short, some compasses no longer spit out reasonable data in the default sensitivity state, so the code actually need to set the compass module to a less sensitive state. We’ve chosen the 4.0 gauss sensitivity state. We are in the process of reworking the kits we have on hand, and we’ll be contacting all those kit purchasers who might potentially have this issue to offer help in fixing it (either instructions in how to reflash the chip, if they have an FTDI programmer, or trade electronics units – we can simply reflash them here, so this will not cost money other than the postage and time). If you’ve got a kit in the field, the symptom of this problem is generally that the North Paw always turns on the same motor, i.e. motor 1 will always be on, regardless of which way you face. On some units, if you rotate the device up so that the x-axis is out of the plane of the magnetic field, you can get the motor to change, because the x-axis won’t be overflowing and ruining the readings. If you’ve got a misbehaving unit, and an FTDI programmer, you can get the updated code here: North Paw V2.01 Arduino Code. Or send me an email eric at sensebridge.net. For quite a while we’ve been offering an assembly service, where for $70 we will custom assemble a North Paw after you order it. This service has been somewhat popular, accounting for perhaps 10% of North Paw sales in total. As of today, we’re switching to instead offering pre-assembled North Paws, made in batches, which is a lot faster (and thus cheaper). Available now for $199: Preassembled North Paw. New microcontroller (attiny24) saves a lot of power, increasing battery life to at least 50 hours! Three animated modes including a mode which enables you to tell your BPM within 10 at a glance. Check out the video I made of the Heart Spark V2.0 modes, I think it looks super cool! As always, the Heart Spark flashes in time with your heart, as measured by a polar chest strap (sold separately). I have a very limited number of beta units available for sale now, if these go quickly I’ll make more. Each unit comes with a metal chain and magnetic clasp. Get yours now for $69! Announcing the next version of North Paw, North Paw V2.0! The new version looks identical externally to the V1.6 North Paw that we’ve been selling for about a year, and internally it’s much the same as well. The only difference is the compass module itself. The HM55B 2-axis compass module that we used to use (made by Parallax) was discontinued, forcing us to find a newer module to base the North Paw around. After extensive searching (it’s not easy to find a <$30 compass module! ), we settled on the LSM303DLM 3-axis compass module with 3-axis accelerometer and tilt-compensation. Although the new compass is not quite as accurate as the older module, we simply used more averaging and got basically the same quality heading output. In addition, because this module has tilt compensation, the North Paw now performs better in tilted situations, such as when you are driving. In all, I believe that most users of the North Paw will not notice much of a change in performance. Our costs have increased slightly, but we are not increasing the price of the kit: it will remain at $149. Anyway, if you’ve been waiting for North Paw to have tilt-compensation, now’s your big chance, get ’em while they are hot! Make Volume 29 features an interview with me, Eric Boyd, about the North Paw and sensebridge. 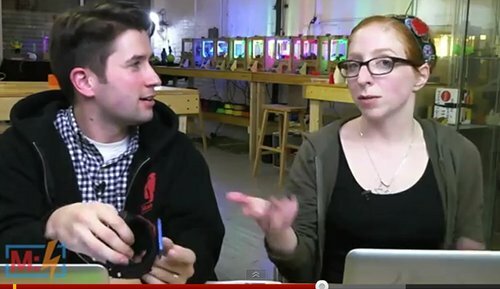 We were also featured on Make: Live on January 11th. The YouTube video is a playlist with 9 parts, they talk about Heart Spark at the 3:45 mark in Part 7. Discussion of North Paw starts at 5:15 in the same video. It was super exciting to hear Becky talk about sensebridge stuff! I’m also keen to see what she does in her new job at Adafruit, congratulations Becky! I’ve launched another interesting electronic jewelry product, called the Sound Spark, over at the sensebridge.com site. It’s a sound reactive necklace pendant. Basically it flashes lights in time with your voice, a really cool effect to draw attention to yourself! The project was heavily based on the bliplace, basically all I did was convert all parts to surface mount, add a button (connected to an interrupt) so you can put the device in standby without taking out the battery, and of course make it pretty using some epoxy, just like I did with the Heart Spark. Those of you really looking can probably see the jumper wire in the photo to the left, turns out I somehow managed to not wire VCC into the microcontroller! The epoxy is totally awesome for making that kind of thing possible in a protected way: that jumper wire is as secure as the rest of the circuit, and that rules. I’m also working on a new circuit tentatively called “Mood Spark” which acts kind of like the mood-rings of old, it’s got a temperature sensor and RGB LEDs and will change color as the temperature changes. No idea if it will work very well, but it should be fun to play around with! UPDATE: I’ve made a tech details page for Sound Spark, you can go download the code, etc. Enjoy! That’s right, we’ve got a sister site now: sensebridge.com! It’s supposed to be more market friendly, look all sharp and fancy, etc. This site, sensebridge.net, will continue to be as it is – crazy hacker/maker website were we can let it all hang out, talk about the development and the code, etc. The new site launches with a new version of the Heart Spark, there are two minor changes: (1) it’s made with black solder mask for the PCB, improving the looks and (2) there are now three switches on the back, the left-most of which actually turns the device on and off. Radical I know! Taking the battery in-and-out was just much more annoying than I had anticipated, so I think this is a major improvement, even if it’s only a minor change in the schematics. I’ve also committed to launching a new product once every month for sensebridge.com over the fall, although the September product might not quite make the end of the month. I basically want to diversify the line-up of ‘electronic jewelry’ products, so that there are a number of choices on the website, and I could theoretically have a trade-show booth and fill it up with cool stuff!